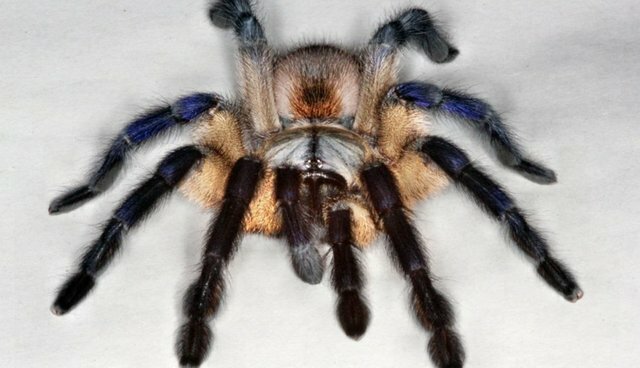 This eight-legged beauty is a Socotra Island Blue Baboon, a tarantula that won Best In Show at the annual competition of the British Tarantula Society. The exhibition attracted more than 30,000 tarantulas, owners and spider-fans. Mike Dawkins, the owner of the award-winning arachnid, tells National Geographic that he was "very surprised to win Best African Species, let alone the Best in Show. That really shocked me." His spider's excellent health and rarity set it apart from the pack. Though they appear fuzzy and fearsome, pet tarantulas don't pose much of a threat to humans -- a tarantula's bite typically causes swelling and smarting, similar to that of a bee sting. The most danger in handling tarantulas is actually to the fragile spiders themselves.